As I suggested almost ten years ago in the book "The Future of Learning: Insights and Innovations from Executive Development”, education has experienced its biggest shift in millennia over the past few years, moving away from the paradigm of a teacher at the front of a classroom imparting their knowledge and being the ‘sage on the stage’. Facilitation of learning, or the ‘guide on the side’ is how executive education tends to aim at try and make the learning stick, and with the advent of social technologies, there has, of course, been a big shift towards the ‘crowd in the cloud’ where the barriers to imparting knowledge have crumbled and individuals learn from each other, where anyone can set themselves up as an expert and help others on subjects ranging from strategy and corporate responsibility to maths and mentoring. An important feature of all these learning delivery methodologies (or ‘teaching’) is that they revolve around ‘knowledge’. Knowledge, of course, is essential, but one doesn’t need a teacher to acquire the knowledge - one can sit quietly with a textbook or one’s favourite websites and read the knowledge. The way people used to. What none of these methods are really good at doing is teaching ‘skills’ - both soft skills and hard skills. They can teach you the theories about teamwork, or influencing skills. You can learn everything about leadership that has ever been written and expose you to great political and business leaders who can explain their own theories on what made them great. But it is still knowledge. Knowing the knowledge does not mean you will know how to use it. 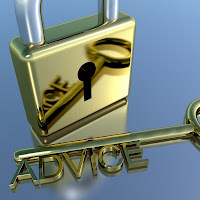 They can teach you the principles of creating a Net Present Value for an investment or developing a strategy for expanding markets, but things would still simply remain theory, with the only practical side being case studies of successful, or unsuccessful situations that other firms have experienced in the past. With the world of business changing at the pace it is, where some estimates suggest that up to 85% of the jobs in 2030 do not yet exist, reading about the past is not always going to be relevant for the future and the knowledge of a dozen PhD theses will not help a manager actually manage better until they have seen what works when, how and why. Hult International Business School’s mission is to be the most relevant business school in the world, and there have been many discussions on what ‘relevance’ means. On the undergraduate program this means preparing students for their future careers, by not just teaching theories and business frameworks (which they do need to know) but, more importantly, giving them a practical experience of applying the knowledge they learn in real-life business challenges with clients ranging from start-ups to Fortune 500 brands such as Unilever, Amazon, Ferrari, McLaren, Virgin, UBS and Micron. What this does is convert the knowledge into skills, the skill of analysing a client’s problem, researching the organisation, the environment and the competition, recommending solutions, delivering those recommendations and thinking about stakeholder management throughout. 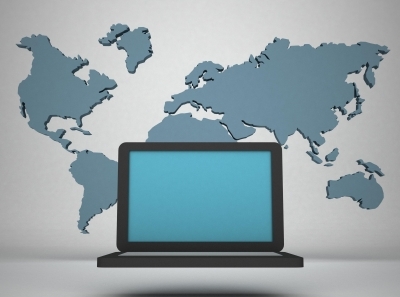 Online learning, as we all know, can be an excellent way of transmitting knowledge. The textbooks of the past can be read online, of course, but the larger publishers have, for a long time, provided an online environment accessible to purchasers of the textbook, where students can go through quizzes and simple games to test their understanding of the materials. Transmitting lectures online is not new – the Open University in the UK made high-level knowledge on a wide range of subjects available to the entire population by filming academics, predominantly with bushy beards and woolly jumpers (starting, as they did, in 1971), and broadcasting the lectures on the BBC. Move on almost fifty years and everyone is able to record anything on their phone and post it on YouTube, from lectures on quantum physics from the world’s top universities, to individuals explaining how to calculate a Net Present Value, or use the business model canvas, or change the inner tube on a bicycle. Once again, however, whilst very useful, this is all about transmitting and imparting knowledge. But how do we teach skills through online learning? The acquisition of skills, of course, can only come through practical experience. It is one thing to know how a piano works, but it takes practice to play it well, converting the knowledge into a skill. And so it is with all relevant and practical learning – creating opportunities for the student to practice the knowledge they have learned and, in so doing, acquire the skill. The worldwide web has revolutionised our lives by giving everyone instant access to the world’s knowledge from their mobile phone. Delivery of that knowledge is through text, pictures, audio and video. The knowledge can be tested through online quizzes or online submissions (such as reports or videos) can be assessed by peers around the world, showing how the ‘crowd in the cloud’ can be both teacher and student at the same time. The challenge for online learning, however, is how to provide the practice needed to turn the knowledge into skills. How to ensure students are engaging online with a project the way you can be sure they do in the classroom, when they are face-to-face with the client and the mentor. How to ensure everyone is listening to the brief – in short – how can you be sure that the student through online learning is paying attention and not, for example, on Facebook, Instagram, Snapchat, WeChat or Twitter? At least in the classroom you can walk around and see what everyone is up to. And environments like MOOCs are great in theory but have a very low completion rate. A challenge for educators everywhere is far more urgent for online educators: how to engage the disengaged? 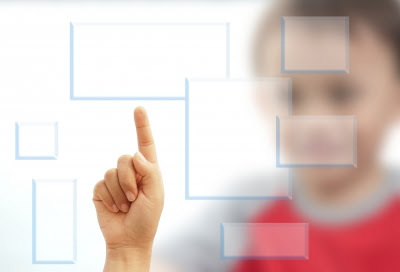 The most common way to engage students in an online practical challenge is through a business simulation, where individuals or teams work on a ‘fake’ challenge and the ‘sim’ regularly gives feedback on their performance via the virtual stakeholders. Simulations are great for practicing with new-found knowledge in a safe environment where the worst that happens is that you lose the ‘game’. There are no real clients to disappoint and no real cash to lose. The best sims provide opportunities for blended learning, where the participants have an offline element, such as talking to investors to request funding, or presenting to a board. This approach can work very well in small, local environments (such as at business school where all the students are in the same building) and whilst the meetings and presentations can take place through a virtual meeting tool such as Skype, GotoMeeting, Citrix or Zoom, it is again too easy for the underperformers to hide, quite literally, off camera. All of the online media described above are very two-dimensional. The ultimate goal of online learning is not to recreate the offline experience (mainstream education has also always struggled with the question of how to engage the disengaged and deliver practical learning experiences to scale) but find a consistent way to deliver both knowledge and skills to a large virtual audience and know that it has been received, acquired and absorbed by the students or participants. Virtual worlds have been a promising opportunity for over 15 years but they have been the preserve of technology evangelists, geeks and early-adopters. A very large percentage of millennial and Generation Z (such as one would find in an undergraduate student body) are surprisingly, shockingly, ill prepared for online interactions. There is a false but widely held belief that young adults are digital natives and therefore completely comfortable with all technology, when the reality is that many confine themselves to a small selection of apps on their mobile. They don’t necessarily know, for example, how to use Microsoft Office efficiently, or use the shortcuts that will help them use their laptops. They do not always know how to add an email address to their mobile phone and they have not all experienced virtual reality. In summary, while online learning is a godsend to all of us to quickly clarify confusions and enable self-paced learning for the busy executives, empowers those far from a major seat of learning to experience the wisdom of the world’s greatest thinkers and allows the crowd in the cloud to share their expertise (we are all experts in something in our own little way), it faces the same problems the traditional educational systems have always faced. Even when we get to the stage that we can implant a chip in our brains which instantly accesses all the knowledge in the world, we still need to learn how to use that knowledge and convert it into a skill. On a personal level, I cannot wait for the chip, and am fascinated to see how the educators of the future will focus on the practical. Gartner’s Hype Cycle shows how the point at which adoption and implementation of technologies by the general public and organisations lags behind the hype surrounding the technology. That time-lag could be months, but in the case of some technologies it could be years… virtual worlds and augmented reality being a case in point. It is only now, 10-15 years after people started talking about the potential of virtual worlds and multi-user virtual environments such as SecondLife that the hardware is finally catching up (through immersive 3D viewers such as Oculus Rift and the type of non-tactile interface provided by the type of technology running the Microsoft Kinnect gaming console), in the same way that 4G connectivity and the speed of mobile phones allows for augmented reality to become viable proposition. Wearables have gone through a much shorter hype-cycle, with consumer-orientated products such as the Apple, Samsung or Motorola watches being desirable gadgets selling in large numbers. But the technologies mentioned have still not achieved the critical mass for organisations to make them an imperative to achieve competitive advantage - most people still use their mobiles for Facebook, texting and that old-fashioned habit of calling people. people are becoming more impatient as the variety of information they have available on their mobile devices allows them to be more connected, share their content more easily and find information quicker. A result of this is that any organisation that puts obstacles in the way of allowing a customer to complete their desired task in the moment is in danger of losing that customer to a competitor. This could mean providing an app that allows the customer to purchase the goods or services on the mobile (at the very least, a mobile-friendly website); allowing them to talk to a customer-services representative when they want to and not just during normal office hours when the customer is at work and potentially not able to call; and allowing the customer to share their experience, or the product with their circles of friends. For many organisations, these principles of putting the customer experience first are obvious and have been a part of the way they have interacted with the customer for many years now… but there are still shocking numbers of organisations that do not put their websites and mobile interfaces through user testing, who allow design to overrule functionality, and who fail to realise that whilst we all embrace new technologies to some extent, there are thousands of sub-groups and niches within any target audience where both the luddite and the technophile need to be catered for. 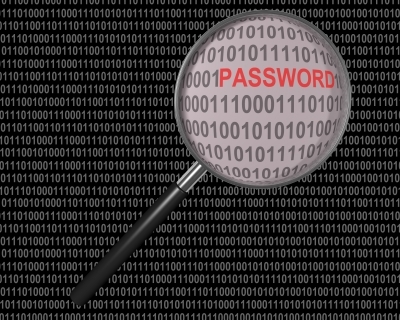 Cybersecurity is the watchword of the day. Hardly a day goes by without mention of the hacking of a large organisation, be it a large tech company, the emails of a high-ranking security official, or a government database. There are those who call for tighter restrictions on what data organisations hold about individuals, in the vain hope that this will help mitigate the risk of the data being hacked. What it should do, however, is highlight the gaping hole in the agendas of the executive boards of those multinationals, where the people responsible, ultimately, for corporate governance and recruiting the C-level executives, are unable to ask the right questions of the management and, therefore, unable to determine if the companies are being sufficiently vigilant against the threat of hacking. An organisation’s IT strategy, which would (should) include cybersecurity, needs to be driven by the business, the organization’s board, rather than from the IT department itself, which would be a case of the tail wagging the dog. The problem is that with so few board members understanding technology, they don’t know what questions to ask – and probably feel that they should be enquiring in to the specification of the firewall, the level of data encryption or the quality of the antivirus package. These questions, however, are precisely the ones for the IT department to consider. But the board needs to think about compliance, their fiduciary duty and their responsibility to increase shareholder value. When these three elements might be compromised by the implementation of the organisation’s technology, the board needs to pay attention. And so hacking is for the business to think about, at the highest level, as it goes to the heart of one of the biggest risks modern companies now face. Hacking will happen. Data is needed to provide products and services for customers and to create competitive advantage. The solution is not to reduce the amount of data held, but to ensure it is properly protected. The boards need to know what questions to ask and whom to ask them of. They need to ask what value the data has on the open (or black) market? What are the potential losses to the organisation if the data is stolen? And how can the organization create a culture where everyone is focused on these questions and is able to raise an early-warning when vulnerabilities are found? Thursday night's news (22 October) featured an interview with Dido Harding, CEO of TalkTalk, the British telecoms group which, according to Wikipedia "is a company which provides pay television, telecommunications, internet access, and mobile network services to businesses and consumers in the United Kingdom". The big news, for those who hadn't heard, was the sustained DDoS attack the site received on Wednesday and where personal data belonging to some (or all) of the 4 million TalkTalk customers was stolen by what were referred to as 'Russian Jihadists' (and later turned out to be a 15-year-old boy in Norther Ireland). Ms Harding (or Lady Harding as perhaps she should be known, after being made a life-peer in 2014) did a good PR job of going around the media and saying 'mea culpa' and 'we made a mistake' and opening herself up to the public drubbing and the fall in TalkTalk's shareprice of 20% in the past 5 days. 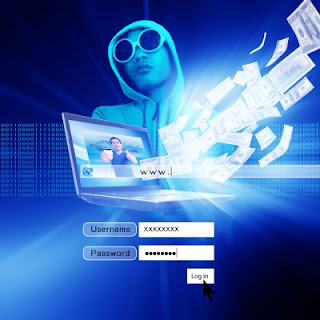 The method of entry the hackers used was, apparently, 'SQL injection', which cyber-security experts suggest is a known access point and is easy to protect. On her appearance on the BBC News she also that she didn't know if the data was unencrypted. Even though it was later suggested that it was encrypted, it took her until 3 minutes and 20 seconds into the announcement before she gave the message that customers should check their bank accounts for unusual activity and other simple precautions they should take, suggesting customers' concerns were not the highest of her priorities. I am a TalkTalk customer and yet, despite the impressive ability the company has to update me regularly about new channels I can subscribe to or when I've rented a new film online, they didn't get around to contacting me personally about the issue until gone 3pm on Friday... almost two days since the attack apparently happened. Perhaps while Dido was talking to the media, someone could have drafted an email and a text? The text wouldn't have taken long... they didn't have a message on the website for a couple of days either. Modern companies will be hacked. This is a fact of life. Just as employers should learn to trust their employees and embrace the possibilities of social technologies, so they should also trust the fact that hackers (who are, themselves, a social technology - allowing multiple people to work together, virtually - to break into computer systems) are going to try and attack them. 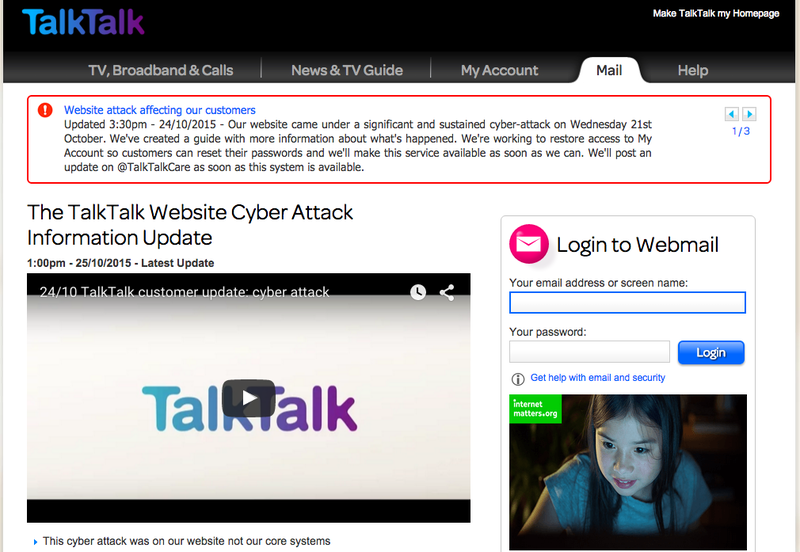 It's not as if TalkTalk hadn't been victim of attack before and they should have been better prepared to respond to it. You don't expect banks to keep your money in a cardboard shoe-box under the counter. You expect them to take every precaution, including signature and PIN identification measures, extra iD and a big strong vault because you know that there are those with a penchant for sawn-off shotguns and wearing ladies' tights on their heads who are likely to be tempted to attempt to steal the money. All of this highlights the fact that the problems at TalkTalk are not ones of technology, they are ones of leadership. Not just Ms Harding's leadership in not appearing not to fill key I.T. roles within the organisation, although the fact that there are personnel changes should not change, in the short-term, the status quo of an I.T. system. The leadership failing is throughout the organisation, not just with C-level executives. 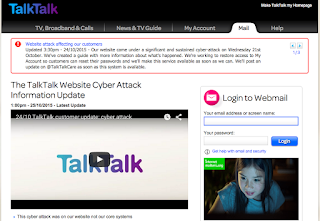 It seems very difficult to believe, that no one in TalkTalk's I.T. department was aware of the failings of the systems they were maintaining. It seems more likely that they either chose to not say anything (and in so doing, showing, in my opinion, a lack of leadership and personal responsibility) or were too scared to. Everyone can show leadership by influencing everyone else in the team to perform to the best of their abilities for the benefit of the team. Everyone needs to take personal responsibility for their actions and the actions they can influence. And everyone should be thinking about the ethical aspect of what they do - are they doing the right thing? TalkTalk failed, furthermore, to embrace the hacker community outside the organisation, possibly believing that if they didn't engage with it they wouldn't get hacked? Perhaps they could have taken a leaf out of Facebook's 'White Hat' programme which invites hackers to identify bugs and vulnerabilities in Facebook's system and, if they had not been previously identified, earn a minimum of $500 (with no maximum - the bounty offered is based on the severity of the vulnerability) - with over $1.3million paid out by February this year and one hacker receiving $30k for identifying a serious hole in Facebook's security. Google have a similar program and by January this year had paid out over $1.5million. This kind of crowdsourcing is not new (Facebook started in 2011, Google a year before that - and crowdsourcing itself goes back over ten years before that). TalkTalk have failed. The technology flaws were unacceptable, but it is the management who are struggling: having failed to think beyond the basics, failed to inspire their teams to do the right thing, and failed to prevent both customers and investors losing faith in them. What do you do with customers who aren't digital? how can we be sure our current and future employees understand how to engage online? how do we reach the non-digital customers, particularly if our products and services are essentially internet-based? what training can we provide, to the general public, to help them reach a higher level of engagement and comfort with digital? what can we do, as managers, within our own organisations, to better equip our teams, our peers and those further up the food-chain so that when we discuss a digital marketing campaign, a plan to manage knowledge online or engaging with our stakeholders through social media, they don't just smile, say 'there there' and mark you down as criminally insane? The digital divide is one that affects every area of society, as I discuss in Making Social Technologies Work, there are large parts of the world getting further and further behind as their societies persist with slow internet connections, a slow uptake of connected technology (be it PCs, laptops or mobile) and, very importantly, as businesses continue to ignore the potential benefits of embracing Social Technologies. Access to the internet, the World Wide Web, should not be considered a 'human right' enforceable by law... it is access to impartial information that should be considered that - however it is delivered. But when those connected to the web benefit from cheaper products and services, greater access to information, which includes impartial information, and when they are able to create their own businesses at near-zero cost, or meet new like-minded people or watch fluffy kittens falling off a shelf (which makes them feel good for a short time), the importance of the digital divide becomes more apparent. It is not in itself that some people have greater access than others where the problem lies, but that the benefits grow exponentially for those connected, and those who are not fall further behind. In the same way that someone learning to read at the age of 20 will fall significantly behind someone who started learning at 5 years of age, so are the socio-economic benefits to the metaphoric 5-year-old hugely increased by starting early. The solution, of course, is education. Educate governments to open access. Educate businesses of the benefits of embracing the web, and social technologies, for marketing, knowledge management, stakeholder engagement, research, new product development. Educate employees how they should engage with social technologies. Educate the population of the benefits of doing everything online, from buying products to paying their taxes, from keeping in touch with family abroad to meeting new people. The education usually needs to start at the top. Politicians. Civil servants. C-level executives in large organisations. Why do we still blame the tools, not the workmen? On the same day that I attend an evening session at my son's school to discuss the use of an online maths resource the pupils will use for their maths homework called 'Mathletics', I see two stories about schools that have banned screens in the education process and, on one case, where they were discouraged at home too, where the school's charter says "We are against all forms of electronics for small children and only gradual integration towards it in adolescence. That includes the internet." The articles included a report by the OECD which had been interpreted by some sites and other media to suggest that children learn 'worse' with computers than without. The suggestion by the other schools is that screens are damaging to the education of the children. I wonder if teachers are concerned that the kids have difficulty concentrating, and are constantly distracted by the screens. It calls to mind the CTO who told me, while I was researching my book, that employees using social media during work hours was not a technology issue but a performance management issue. If the managers who wanted him to block Facebook so that their teams were not distracted were better at motivating the teams, distraction wouldn't be an issue. And back in the eighties when I was temping in over a dozen different offices, I found plenty of ways to distract myself if I was bored or felt unchallenged. This was before the internet. Back then we had books. Newspapers. Magazines. Comics. Telephones. Doodling. Tea breaks. Toilet breaks. Extended lunch breaks (down the pub for a game or three of pool). Banning something doesn't get rid of it (drugs, alcohol during prohibition, homosexuality or abortion in decades past) and often makes it more attractive. Forbidden fruit and all that. Children who don't have access to screens will not learn how to code. How to hack machines. They won't have access to the wealth of knowledge available on there web. They won't learn how to create and edit videos, record music, publish their own creativity. What is frustrating is that the charter from that London school banning all screens seems to echo the rejection of technology by the Amish societies. Of course one can learn well without screens. Of course screens can be distracting and can be a disincentive to concentrate. But the reality is that people have screens all around them. What they need is education and training on what constitutes sensible and appropriate usage. When to use screens and when not to. They will not, as I fear some of the children at the schools that reject screens might be, unprepared and even fearful of spending their days with screens. That is how many, if not most, of us spend our days. We use screens. If the screen stops someone learning appropriately, or working efficiently, then the teacher or manager needs to look hard at their own techniques. Stop blaming the technology, and start looking for more creative solutions that do not banish technology but embrace it and put it in context. 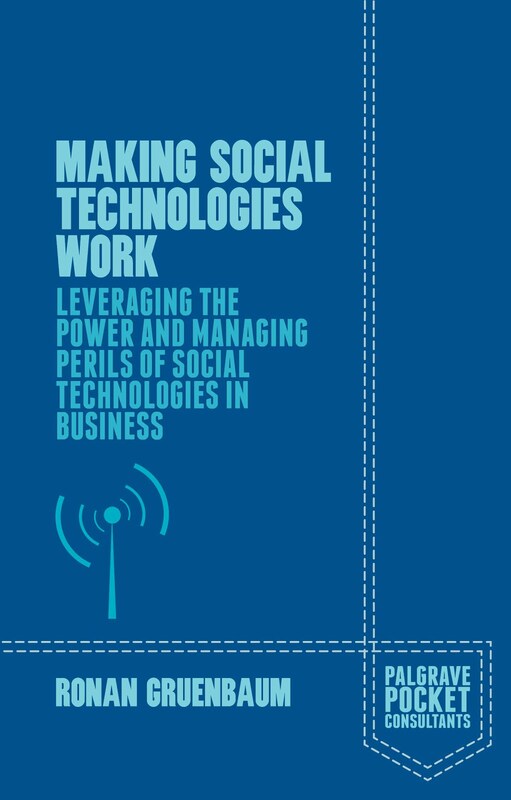 What I can hope for is that those children will go up, clueless, and ready to read the umpteenth edition of my book 'Making Social Technologies Work'... I can but hope. As someone who tries to keep their eyes on technology, innovation and the actions of the big online companies to see what's happening next, it is rather shocking to occasionally see old news polished up as new. 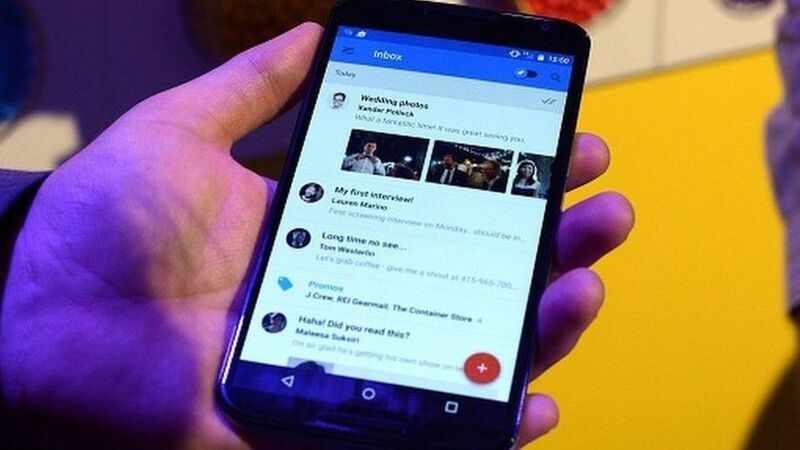 An example of this is from today's BBC News showing an article about Google's wonderful email service, Gmail, providing an 'Undo Send' function for up to 30 seconds after an email has been sent. Shocking because the feature in question has been a 'Labs' feature, available to all Gmail users, for many many years. For me this is as heinous a crime as believing that a song on X Factor (or it's many equivalents) is original without realising that it had been written and recorded 30 years previously. As I've mentioned previously, a fine example is those who think Steve Jobs invented digital music, the digital music player (iPod) and mp3s. I, like many, had an mp3 player long before Apple's guru realised the potential of music and the company I worked for sold legitimate, legal, digital audio downloads long before iTunes thought people would pay for stuff online. This is not to denigrate the wonderful job Jobs did in marketing something that the pioneers couldn't get out of the 'Innovators' stage of the Diffusion of Innovations curve... they didn't even reach Early Adopters in some cases - but they were, clearly, the future. So Google having an 'Undo' button on Gmail is not an innovation. It's not a revelation. it's not fascinating. It's clearly a slow news day... and thank Christ for that. If we got through a day without a massacre somewhere in the world being reported by the news, then hooray for out-of-date tech news! After a long time with no time to post, I find myself posting on Gamification whilst listening to a talk by @Yukaichou from Enterprise Gamification Consultancy at Hult International Business School organised by a student @NKakuev. He has been listed a 'top-5 gamification guru' on a UK Leaderboard apparently and having been to other talks about gamification, here is someone with 10 years' experience that appears to actually know what it is about. One of the examples he talks about is how to create a game called 'FoldIt' to help create a protein structure for the AIDs problem. The problem existed for 15 years and was solved in 10 days. Another example listed is SAP Community Network where they added game elements into their system and managed to increase their Active Users by 1300% and Activity by 2300%. As Yu-Kai says, this is not a start-up - that 1300% growth is significant when one is talking about SAP. Example 3: Autodesk - where people go to different countries and people solve different problems. It might be fixing a bridge (etc.) and you have to use a free trial of Autodesk - the trial use increased 54% and Sales Revenue increased by 29%. Yu-kai wrote a list of Gamification stats that are useful to help show ROI. Which sounds like the process people go through with feedback... which brings us to Gartner saying that 80% of gamification attempts will fail due to bad design. So how do you get better design? Good Game Design asks the question "How do I want my users to feel?" Yu-kai gave a great talk about what gamification is and what works, what does not work and how people who want to use gamification should focus on engaging users rather than just causing addiction. He has a framework called 'Octalysis' based on the 8 core drivers above. He plots a matrix showing Discovery, Onboarding, Scaffolding and Endgame against Achievers, Explorers, Socialisers and Killers. What surprises me is the number of people who still don't know what Gamification is, let alone whether or not it should be for them. This is the same noise people made when social media first came about: 'it's for kids' or 'it's not relevant for my business'. If you can make people enjoy engaging with your business, they will. It should be obvious... I'll watch with interest how much people continue to treat this as 'new' over the coming years. So why the title 'Gamification of Life'? Is life a game? There is an end-point. There is a level of competition in every aspect of life: key points of the game (school, university, grad-school, relationships, marriage, children, jobs, careers, career-changes, recognition, fitness, beauty, wealth, longevity, popularity, altruism....) can cause people to compete and compare themselves with others (favourably or otherwise). A lot of apps focus on this to help people eat less, do more exercise, spend more sensibly... so it would be interesting to see how this could be used to help individuals 'improve'. Essentially, I'm thinking of how to gamify therapy: we all need that! What’s in a name? Would an Apple, by any other name, smell as sweet? Would Jobs and Wozniak have had as much success with their company if it had been called Lemon? Would a Blackberry be better as a Raspberry or a Gooseberry? Would Raspberry Pi sell as quickly if it was Apple Pie? With tech products there is no hard-and-fast rule of what works and what does not. Is Apple’s habit of naming OSX versions after big cats (Panther, Puma, Mountain Lion) better than Google’s rule of naming Android versions after deserts (Froyo, Gingerbread, Honeycomb, Ice-Cream Sandwich, Jellybean…)? Does it make one product more likeable than another? Does it make it more reliable? Does it sell more? Are either of them fundamentally better (leading to greater brand recognition and helping drive brand loyalty) than Microsoft’s Windows versions (Windows 95, 97, Millennium, XP, Vista, 7)? Some tech products have names that have little more thought behind them than no one else had the name and the inventors liked it (see Firefox). Others used branding experts to exhaust all possibilities in the search of the one, true, perfect name (iPod). Some brands are vanity projects (Dyson and Dell) whilst the actual product names are instantly forgettable (Latitude E6320 anyone?). In an age of multiculturalism, anyone thinking of branding has to think how the name will be received in different countries and languages. Mitsubishi should have consulted their Spanish office when deciding to call their 4x4 ‘Pajero’ (which has connotations of self-pleasuring in the Iberian language) and, because it has to succeed in the USA to gain global acceptance, the name must be easy to pronounce in English. It can have connotations of space (Galaxy) or be an acronym (Vaio). It can be frivolous (Twitter) or a compound pun (Pinterest; Instagram). It could even evoke the beginnings of a burning fire (Kindle). People who create, design and program tech products, have long had a sense of playfulness. Perhaps it is the ability to create something from nothing, and name it, that gives a sense of power. It is different from naming a child as one must consider the feelings and opinions of one’s spouse, relatives, the child’s grandparents and, in some cases, if the name is so odd, if it will lead the child to get beaten up at school. With tech products there are no such limitations. But there are no rules either. Some fruit are suitable names… but not all fruit. An Apple computer would perhaps not have the image it does if it were a Lemon or a Banana. Calling a smartphone a Blackberry might seem obvious now, but would we have embraced it if it had been called a Raspberry or even a Gooseberry? The idle sound of birds talking led to the name Twitter…but it could just as easily have been Natter, or Cheep-Cheep, or Noise. Raspberry Pi, the new open-source credit-card sized computer, has as much connection to its name as Apple Crumble or Strawberry Sigma. The two main sources of computer operating systems have very different nomenclatures but neither indicates, at all, what the products actually are nor what they do. Some names, therefore, are designed to clearly differentiate themselves from the previous version, or maintain an air of seriousness some might consider appropriate for a business, such as with Microsoft Windows’s Millennium, XP, Vista and 7. Some try to exude power and passion, such as Apple’s OSX Cheetah, Puma, Jaguar, Panther, Tiger, Leopard, Snow Leopard, Lion and Mountain Lion over the same period. Some try to suggest a sense of fun, as with Google’s mobile operating system Android, which uses deserts in its naming: Cupcake, Donut, Éclair, Froyo, Gingerbread, Honeycomb, Ice Cream Sandwich and Jelly Bean. Some product names have little more thought behind them than no one else had the name and the inventors liked it (see Firefox). Some brands are vanity projects (Dyson and Dell) whilst the actual product names are instantly forgettable (Latitude E6320 anyone?). Tech products often try to suggest the future, or science fiction. So any suggestion of space is valid, as with Samsung’s Galaxy range, or Sun. Acronyms will sometimes work, such as with Sony’s Vaio range, whilst some companies go for compound puns, such as with Pinterest or Instagram. A verb suggesting the beginnings of a roaring fire might, for some, be a strange alternative to paper-based books (Kindle). One can go through a complex branding exercise to try and suggest a name that summarises the essence of the product (iPod), or one can name a product after one’s daughter (Apple’s Lisa or the MySQL database) or a popular TV programme (Python) or an item of clothing the founder wears (Red Hat Linux). From a recent project run for Masters in Digital Marketing students at Hult in conjunction with Greenlight, the SEO specialists, one of the key learnings for students was how to build links and the importance of link equity for SEO. It is, therefore, always nice to see learning in practice - and this embeddable widget from OnlinePhD.org is a fine example of how to do it. Their simple graphic was on Mashable and shared from Mashable's pages over 1000 times - and each embedded copy of the widget will include (if not explicitly deleted) a link to OnlinePhD - thereby making the site more popular in the eyes of the great Google and, therefore, more likely to increase its Google rank. So, since it is useful, and to remind myself in the future how to get better results from Google, I have also embedded it here. Kudos to OnlinePhD (or their SEO advisers). Creativity is easier said than done. Where do creative people get their inspiration from? Where do ideas come from? When is an idea a good idea, and when is it fantasy? In business terms, how do you identify an idea that has 'legs' or potential to become a sound business? Much has been written on the creative process and how to become entrepreneurs. Much comes down to luck. Malcolm Gladwell, in his book 'Outliers', points out how the biggest names in technology: Bill Gates and Steve Ballmer (founders of MicroSoft), Steve Jobs (from Apple) and Scott McNealy (from Sun Microsystems) were all born between 1954 and 1956 and, through the luck of location and access to computer facilities at a young age when most could only dream of using a computer, were able to get large amounts of experience (10,000 hours according to Gladwell's rule). Had they been older they probably wouldn't have had access to the tools to get that valuable experience - any younger and someone else might have got their first. "I'm a firm believer in luck, and I've found that the harder I work, the luckier I get." So if one wishes to take these quotes as guidelines for achieving success, one has to work hard and be ready to embrace new opportunities. If one takes that a little further, identifying opportunities is no easy task. It involves risk. It involves change. The risk averse are unlikely to be successful entrepreneurs, but there is no reason to think they might not be highly successful corporate executives. Coming back to the issue of ideas, again much has been written about where ideas come from. Online guru Seth Godin has also posed the question and produced a list of 20 points that might help. A very wise woman once said "Ideas come from connections." Jared Diamond's book on the fates of human societies: "Guns, Germs and Steel" connects all the dots of human development to show how luck and connections were fundamental to some societies developing more technology, infrastructure and art at a faster rate than others. Luck in terms of the natural resources available where they were (including minerals and beasts of burden) and connections in terms of being able to exchange ideas and technologies ("I'll swap my axe for your spear") with other societies. So if you need an idea, connect your subject matter to others. See how other societies live. See how other specialists work in their field. Can their knowledge be useful in your field? Can yours be useful in theirs? Connect to people. Connect your business to others. Network. Through connections, ideas will flow. The postings on this site are my own and do not necessarily represent positions of any institution of any kind, regardless of my relationship with that institution. (c) All content copyright SealTree unless otherwise indicated. Simple theme. Powered by Blogger.